Valley Settlement is an essential partner organization with Mountain Family Health Centers. We value the nonprofit’s dedication to working with immigrant families in the Roaring Fork Valley to promote early childhood development, advance opportunity, and reduce barriers to accessing vital community resources. Earlier this year, Valley Settlement shared the story of Don Jesus, a thoughtful and diligent community volunteer who also shares his time with Mountain Family Health Centers at our Glenwood Springs community garden (also called our “Farmacy”). We deeply appreciate Don Jesus’s support for the garden and the opportunity to share his story with our partners and community members. Here is Don Jesus’s story, courtesy of Valley Settlement. 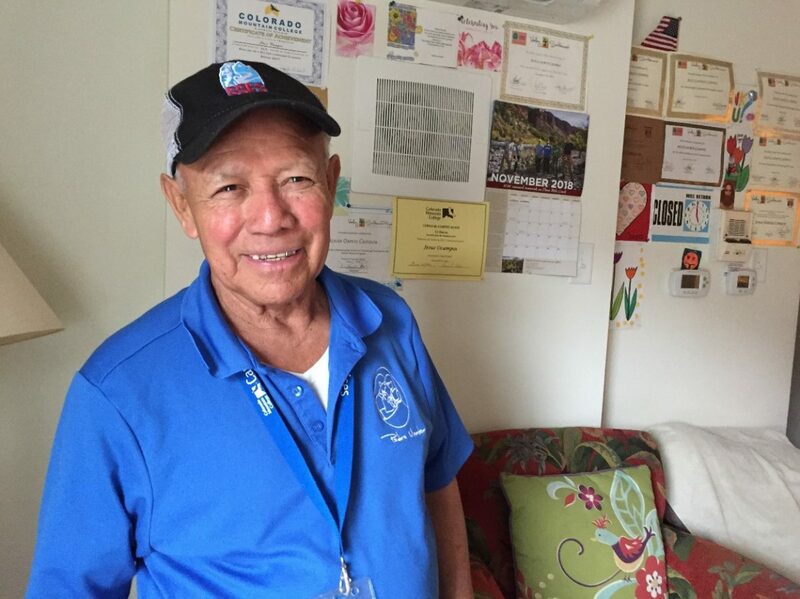 Don Jesus originally came to the United States from El Salvador in 1964 on a work visa. A young father of seven, his career kept him on the road until he retired. Several years ago, he was diagnosed with cancer, and moved to the Roaring Fork Valley to live near his daughter and to be treated at Valley View Hospital. At one point, his doctor told him that if he survived his thyroid surgery, he might never be able to speak again. During his cancer treatments, Don Jesus became depressed. His doctor referred him to a mental health professional, who referred him to Valley Settlement and the Parent Mentor program. “I feel that my life has totally changed,” he says, “Totalmente.” In addition to volunteering every day in the art room at Glenwood Springs Elementary School, Don Jesus is taking adult education classes through Valley Settlement’s Lifelong Learning program to pursue two of his long-time goals of learning English and how to use a computer. He wears his blue Parent Mentor polo and school ID badge with pride. “All my children, except for my daughter, live far away. I talk to them and tell them what I am doing, what I am learning. They tell me they are very proud of me. Junior, my youngest, says that when he grows up he wants to be just like me – and he is 52!” Don Jesus’s apartment walls are covered with drawings that the school children gift to him, as well as graduation certificates from Valley Settlement’s Parent Mentor and Lifelong Learning programs. Don Jesus participates in two of Valley Settlement’s six programs, Parent Mentor and Lifelong Learning. Parent Mentors dedicate 300 volunteer hours to Roaring Fork School District elementary schools each year, working alongside teachers to support student learning. Lifelong Learning provides adult education classes in Spanish to further education in English, math, language arts, Spanish literacy, computers, and more. Lifelong Learning acts as a bridge to Colorado Mountain College, providing adult learners with a strong foundation to continue their education.